Those of us who reside in the big cities will recognise Nightglow – the warm, luminous brown haze that coats the sky on a cloudy evening; a golden streetlamp that casts a dim but steep shadow over the footpath; the moonlight that beams through the curtains. Nightglow is seemingly antithetical to our perception of the darkness of the night, yet inseparable from our reality of it. It has both natural and artificial sources, bothering both nocturnal animals and amateur astronomers alike. This piece is a musical expression of the colour, mood and sound that such images evoke. The melodic and harmonic palette shades between clarity and ambiguity, with long threads of material being cast through the texture. Nightglow is dedicated to the outstanding Polish duo of Andrzej Karałow and Pablo Sánchez-Escariche Gasch. This piece was composed for my dear friend and fine hornist, Alden Cai. Cast in a single movement, Fantasia explores alternation between two contrasting states – one of rugged energy, and the other of tranquillity and solitude. These states are not in conflict but run in parallel, sharing the same thematic material. 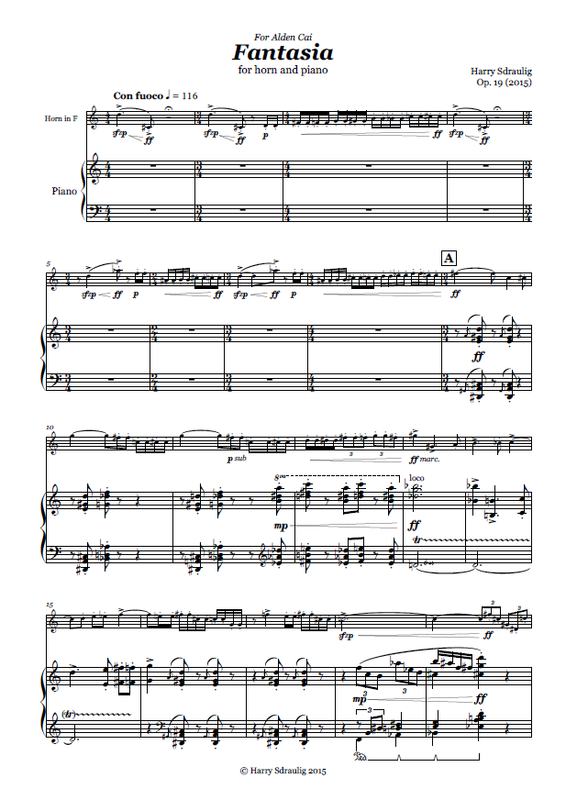 The Sonata for Flute and Piano was completed in September 2014 and is dedicated to my partner, flautist Kim Falconer. 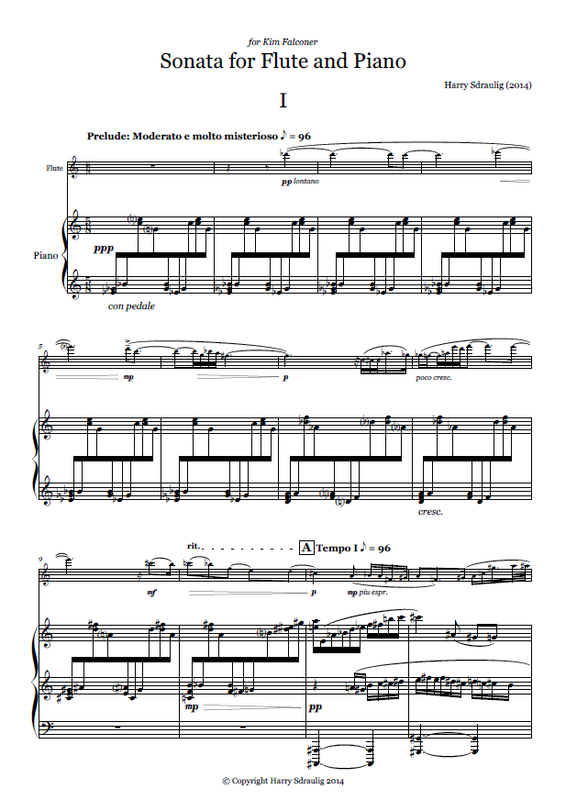 With this piece, it was my intention to compose a work of virtuosic demand for both instrumentalists, full of contrast and containing a wide variety of expression to give the performers an opportunity to showcase the breadth of their musicality. The work is in four movements. A mysterious, introverted Prelude precedes a humorous, flickering dance, entitled Badinerie. The third movement, a more expansive and outwardly expressive Romanza, is followed by the Finale: a fast, virtuosic show-piece to round off the work.